A column of armored vehicles crosses the Afghan-Soviet border on the Friendship Bridge over the Amu Darya River. Soviet-built projects helped bring about development and social change in Afghanistan in the 1960s and 70s. Many of these infrastructure projects have survived war and are still operational. RBTH looks at five major projects that are of vital importance to Afghanistan. Khaled Hosseini’s novels often paint a rosy picture of life in Afghanistan in the 1970s. Much of the modern pre-war infrastructure and educational institutions of that time were built by the Soviet Union. Despite the ravages of war, several Russian-built projects in the country are functional and of vital importance. RBTH looks at five major projects that are still in use in Afghanistan. Built in the 1960s, the 2.6 kilometer-long tunnel is an artery that connects Kabul with cities in northern Afghanistan. It is the only north-south tunnel in the country that is in use throughout the year. Around 10,000 vehicles pass the tunnel every day. It cut travel time from Kabul to northern Afghanistan by almost 62 hours. Moscow agreed to construct the tunnel under the Salang Pass on the Hindu Kush Mountains in 1955. Considered an engineering marvel, the tunnel, which reaches an altitude of 3400 meters above sea level, was thrown open to the public in 1964. It was the highest road tunnel in the world until 1973, when a slightly higher tunnel was built in the United States. Mikrorayon (taken from the Russian word for micro-district, "микрорайон") is one of the most well known addresses in the Afghan capital. Located in western Kabul, construction of this complex of prefabricated residential buildings started in the 1960s. The ‘Khrushchevka’ buildings, which look like any of their counterparts in Russia and Eastern Europe, were built to bring the Soviet vision of modernity to the people of Afghanistan. The Mikrorayon did not just house the elite of Kabul, but was also home to the middle and working classes. The main building of the university was built in Soviet modernist style and the campus has several Socialist murals. The university came under heavy fire during the Soviet-Afghan war and was forced to shut by the Taliban. It has since been restored and reopened. A large number of the university’s faculty members were educated at the People’s Friendship University of Russia. The Soviet Union also built and engineering school and auto-mechanic institute in Kabul, both of which are functioning. Although not built with altruistic purposes in mind, the rail and road bridge, which was opened in 1982, is the only fixed transport link across the Afghan-Uzbek border. 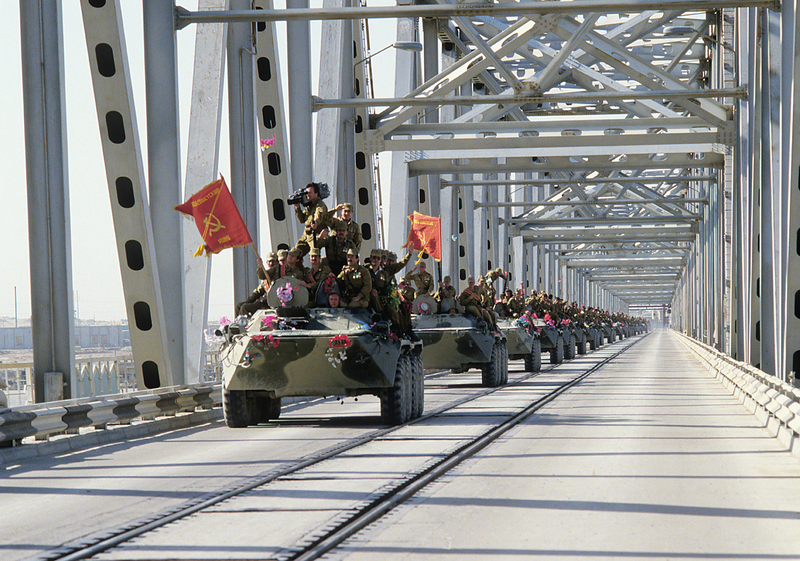 The bridge was built by the USSR to supply its troops in Afghanistan, and is featured in an iconic photograph of the last Soviet troops leaving the country. The Uzbek authorities shut down the bridge in 1997 when the Taliban was in power in Afghanistan. Reopened in 2001, it is one of landlocked Afghanistan’s main access points to the trade routes of Central Asia. Located in the Ghazni province, the dam was constructed in the 1960s and provided irrigation for 13,000 hectares of land. Band-e Sardeh has a capacity of 259 million cubic meters of water. It has also plays an important role in flood control in the region. Land around the dam is under-cultivated at the moment, largely because of attacks on farmers from the Taliban. The Russians also built an airport near the dam, which is now used by the United States and its allies in their fight against the Taliban insurgents.